First developed in the 1880s, located two miles east of downtown, historic Inman Park is Atlanta's first planned community and one of the nation's first garden suburbs. Originally planned for the very wealthy, you'll find some of Atlanta's most beautiful Victorian homes in Inman Park. With the dawn of the automobile, Inman Park was quickly deserted by the upper class, the large homes were subdivided and bungalows began springing up. Listed on the National Register of Historic Places, Inman had a redevelopment 30 years ago and has become greatly loved by its current residents. Just north of Inman Park and southeast of the Highlands you'll find Little Five Points, originally named due to the connection of five train lines of MARTA at this location. You'll find an "alternative edge" to the folks that wander the streets of L5P. Impromptu jam sessions of bongos and guitars will often break out on the sidewalks in front of the montage of secondhand shops, piercing parlors, funky bars and music venues around the corner from where Euclid and McLendon Avenues converge on busy Moreland Avenue. 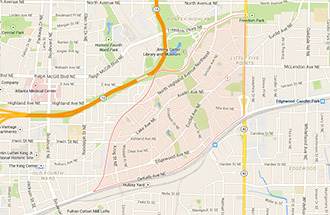 Candler Park to the east is adjacent to Little Five Points and is another well-known old Atlanta neighborhood. Like Little Five Points and Inman Park, the Candler Park neighborhood is priced well beyond the reaches of the average bongo player. Originally frolicking in the 1920s, the area had resurgence in the 60s and has grown more popular and pricey ever since. Fully restored bungalows and even post-Civil War era homes line the peaceful streets nearby, including many bed-and-breakfasts. And if golf is your thing, Candler Park Golf Course offers prices that are unbelievably reasonable. These neighborhoods are also home to the Jimmy Carter Presidential Center and Library. It sits on several hilltop acres of gardens and ponds, the site of the camp from which Sherman observed the burning of Atlanta in 1864.